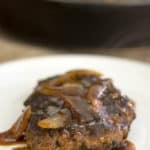 Keto Salisbury Steak | Mushroom and Onion Gravy! 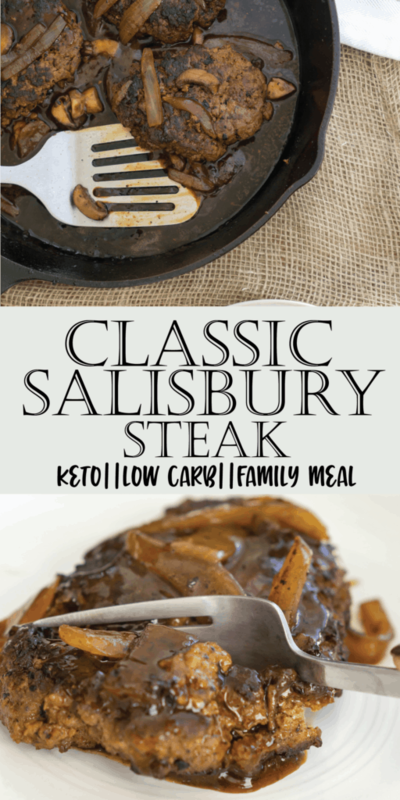 Prior to making this Keto Salisbury Steak recipe, the only way I enjoyed Salisbury steak was from a Hungry Man Box, and I'm sure many of you can relate. It was my favorite meal next to their fried chicken, and it never disappointed. I thought, why not give it a try at home using keto friendly alternatives. I did not expect it to taste this good and be so easy to make. I would have been making this recipe much earlier had I known it only takes one skillet to make. One of our favorite ingredients to buy is 80/20 ground beef. Not only does it have great fat to protein ratio, but it tastes delicious and can easily be transformed into a dinner everyone will love. Some of our favorite ground beef recipes include our keto chili and keto lasagna! Hamburgers are always a quick go-to lunch or dinner and you can top them with fried eggs and cheese! This recipe can definitely become a staple in your household and we can say, with confidence, that everyone in your family will love it. You Get an Easy Brown Gravy Recipe Too! 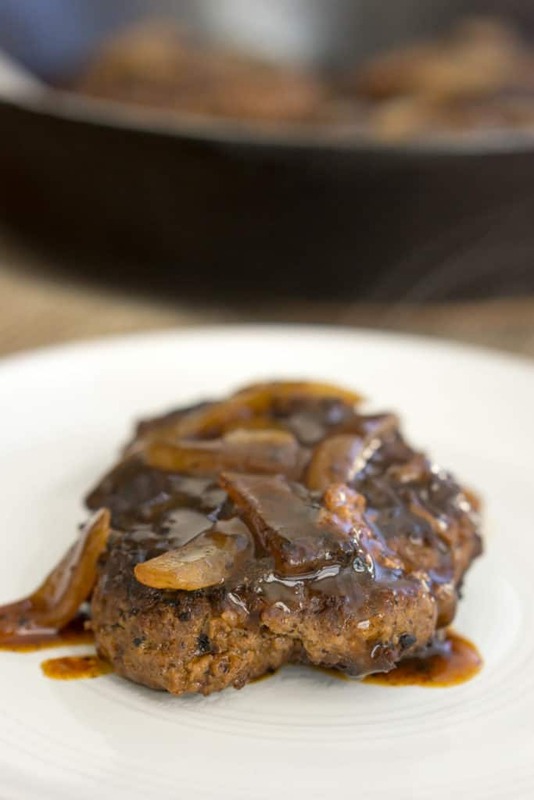 If you omit the ground patties in this recipe, you are left with an easy brown gravy recipe. It's rich in flavor and the perfect thickness to top your mashed cauliflower or keto fried chicken! The base is a simple beef broth that takes on the flavors of onion and mushroom. You finish it off with a little xanthan gum to thicken it. However, you can always reduce it longer and leave out the xanthan gum if you don't have any on hand. We also have another simple, gravy recipe on our food blog if you are looking for a different flavor profile! There may be some of you confused by the term steak, considering I have been talking about ground beef. Well, don't feel foolish because it wasn't until a couple years ago that I found out the steak wasn't really steak. Regardless of whether or not you find the name to be fitting, this recipe should definitely be on your "gotta make this" list. 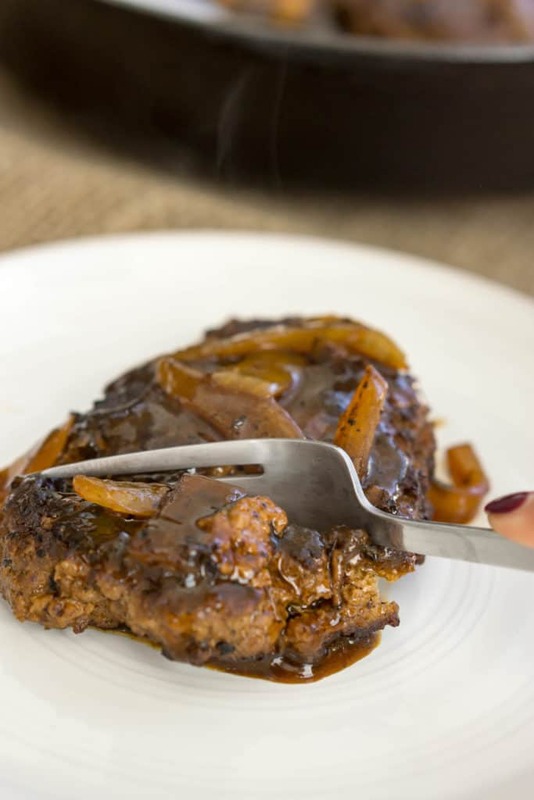 If you're not a fan, that's okay, because this keto Salisbury steak recipe is bound to win over the heart of someone in your family. 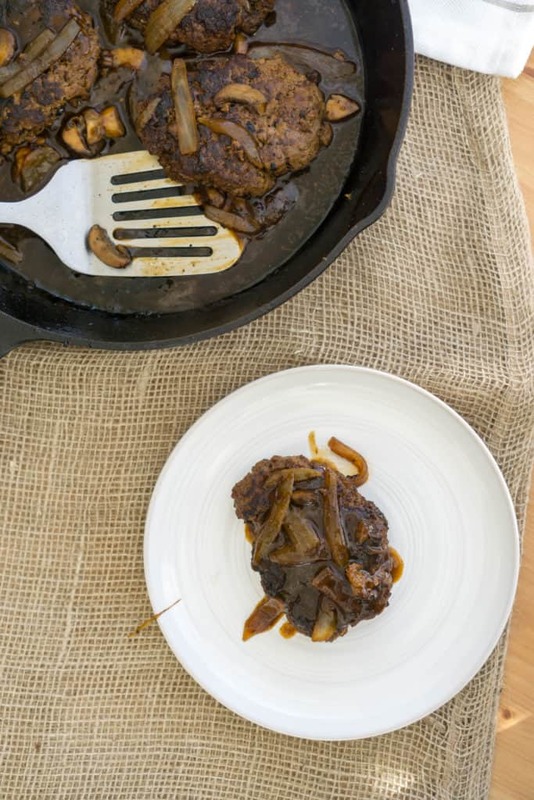 Recipe can be quickly added to MyFitnessPal - Search "KetoConnect - Keto Salisbury Steak"
Slice the onion and baby bella mushrooms and set aside in a bowl. Heat a large (we used a 12 inch cast iron) skillet to medium high heat. Add 1/2 tbsp coconut oil to the hot skillet and add the four patties to the skillet. Cook 4-5 minutes on each side, until fully cooked through and crispy on the outside. Remove from the skillet and set on a plate. Add the chopped onions and mushrooms and combine using the spatula. Cook for 3-5 minutes until the onion and mushrooms are tender and cooked down. Add the beef broth, ketchup, and worcestershire sauce and combine.Bring to a boil and reduce for 3-5 minutes. Add the xanthan gum, whisk to combine (ensure to get all the xanthan gum clumps mixed in) and then add the cooked patties back into the gravy mixture. Cook for an additional 5 minutes, flipping the patties half way through.